In the fast few decades, mathematical problems originating from material science and biology have stimulated significant developments in the modeling, analysis and simulation of multiscale systems. This workshop will focus on mathematical challenges in modeling, nonlinear analysis of PDEs, calculus of variations, and computational methods that have emerged from such developments. 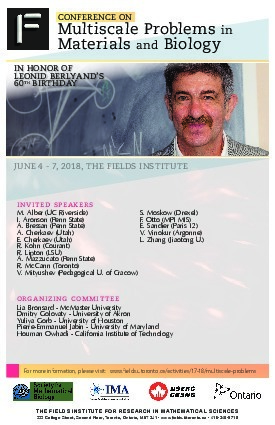 The workshop will honor Leonid Berlyand’s contribution to mathematics of materials and biology on the occasion of his 60th birthday. The workshop is aimed at mathematicians as well as theoreticians and experimentalists from other disciplines with interests related to the topics of the meeting. The workshop will serve as a forum for researchers at different stages of their career, and from different scientific backgrounds (in mathematics, physics, biology, and engineering), to share their experiences, exchange ideas, identify open problems and initiate new collaborations. The workshop is organized around mathematics relevant to the following application areas. - Modeling of phase transitions and structural defects in superconducting materials, micro-magnets, and liquid crystals. Research in this area deals with multiscale problems involving fine scale singularities interacting with macroscopic fields. - Modeling of heterogeneous media, including novel computational approaches to homogenization with nonseparated scales, inverse problems, mechanics of composites and scattering waves. - Emergence of collective motion in systems where interactions between individual units (e.g. bacteria, flocks of birds, schools of fish) produce complex phenomena of self-organization. - Microscopic modeling in cell biology. - Multiscale problems arising in the medical field, focusing on interactions between mathematics and physiology. Two-scale Gamma-convergence and random non-convex homogenization. Modeling and robust design of objects with uncertain behavior: Damage spread in beam lattices. Scattering by obstacles with periodic material properties and the effect of boundary correctors.